The first quarter for 2017 is coming to an end which means that payroll tax returns will soon be due. With a new year, come new rules and regulation changes to the Illinois payroll forms. In particular the IL-941 Form will look vastly different than it has in the past couple of years. Here we outline the changes to the form that Illinois employers need to be aware of. Each employer is now required to file Form IL-941 quarterly even if no tax was withheld during the reporting period. Therefore there is no longer an annual filer box to check but instead at the top of the form in the Reporting Period box you need to indicate what quarter you are filing. 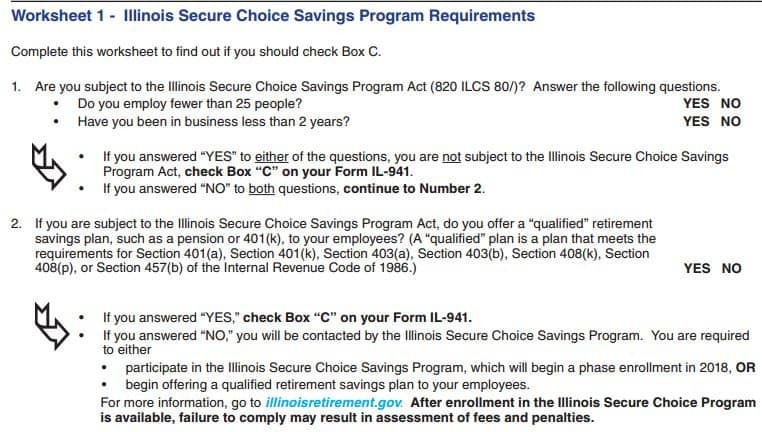 Box C under Step 2 was added to comply with the Illinois Secure Choice Savings Program Act. This Act requires employers with 25 or more workers, who do not already offer a retirement plan to their employees, to enroll their workers in a state-run Roth Individual Retirement Account. Below is a worksheet that will aid in the decision of whether or not Box C should be marked. Step 4 of Form IL-941 has been reformatted to include a section to record payroll withholding dates and amounts. This is similar to Schedule B of the federal 941 Form. The exact amounts of Illinois income tax withheld should be recorded on the date you paid the compensation to your employees. Only record the amounts on days you made the withholding and leave the remaining days blank. If no compensation was paid within the month / quarter, only fill out box 2A, 2C, or 2D. IDOR-Approved Credit – Line 8 to report a credit balance was removed. If the withholding liability (line 6) is greater than the withholding deposits already paid (line 2), i.e., your total payments are greater than your total liability, then you MUST file Form IL-2000. This form requests for a verification of an IDOR-approved credit. Only once this form has been received, can you take the credit on any future IL-941 Forms. Electronic payment required for semi-weekly depositors – Furthermore, if you are a semi-weekly payer for remittance purposes, you must also pay your balance due (line 7) electronically. See the full list of instructions for 2017 IL-941 Form for more information. If you would like additional assistance, please feel free to contact our Accounting Solutions Team. Tina is an accounting solutions senior accountant. She earned a bachelor’s degree from Saint Xavier University with a double major in accounting and finance. Prior to joining Selden Fox, Tina worked at a Big 4 accounting firm.